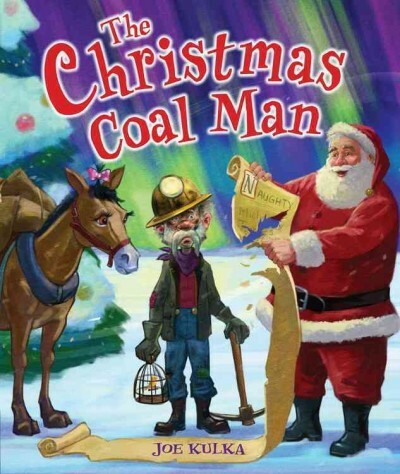 Annotation: Working hard throughout the year in dark mines to collect the coal that Santa distributes to children on the naughty list, a Coal Man saves money for an island vacation to share with his mule and canary and gets a big surprise while making his annual delivery to the North Pole. - Coal miners; Juvenile fiction. The Coal Man has been saving up to move to a tropical island. Unfortunately, Santa has bad news: he no longer needs the Coal Man's services ("The whole coal-in-the-stocking thing just isn't working"). This is an inspired elaboration on an overlooked aspect of the Christmas mythology, and everybody celebrates in the end. Too bad the art can be off-puttingly foreboding. [Page 65]. (c) Copyright 2015 Library Journals LLC, a wholly owned subsidiary of Media Source, Inc. No redistribution permitted.